Various types of blades that slide into handles as well as full handle and blade sets. Manufactured by Surgistar. Sterile. Sold 6 per box. 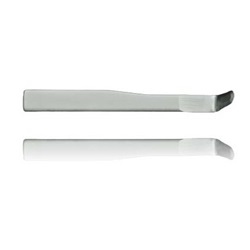 Scleral blade and handle set, #57. Standard US style. Scleral blade only that slides into a handle, #57. Standard US style. Lamellar blade only that slides into a handle, #66. Angled tip, bevel up.